A Nielsen survey indicates that at the end of 2010, nearly a third of US mobile users had smartphones, with the installed base evenly tied between Apple, RIM, and Android licensees. 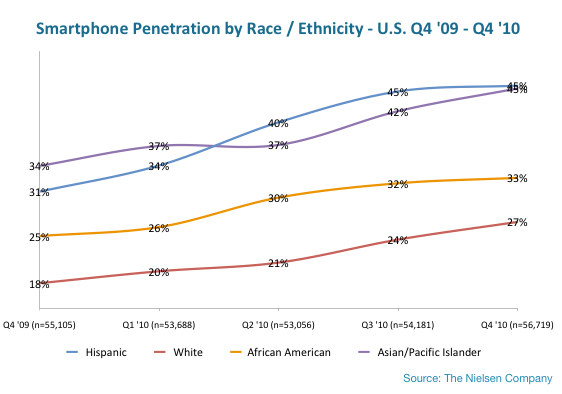 The Nielsen report focused on racial demographics, noting that just 27 percent of whites owned a smartphone, while 33 percent of African Americans and 45 percent of both Asian/Pacific Islanders and Hispanics opted for a mobiles with "app-based, web-enabled operating systems." That difference was was related to demographic populations that "tend to skew younger." Among all groups, smartphone use is on the rise. 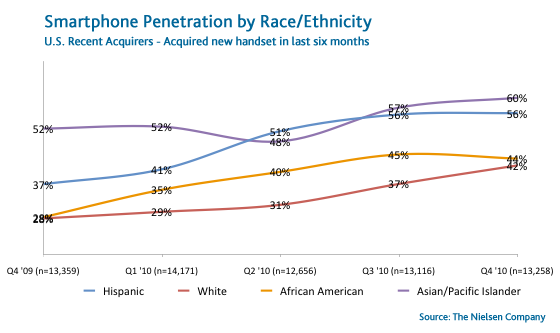 Recent buyers who acquired a new phone in the last six months were even more likely to have chosen a smartphone, with 42 percent of whites, 44 percent of African Americans, 56 percent of Hispanics and 60 percent of Asian/Pacific Islanders upgrading to a smartphone. 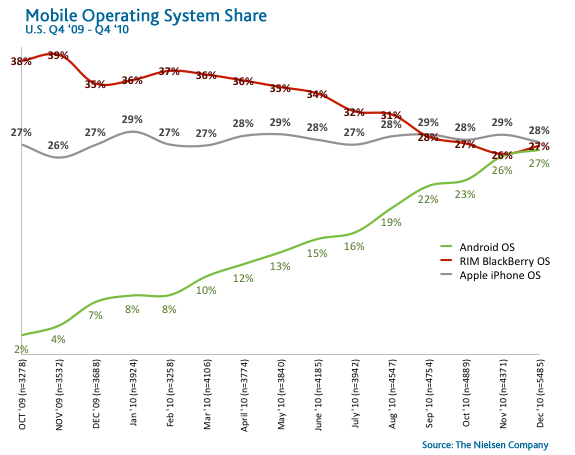 Over the past year, Nielsen charted a relatively steady 27 percent market share average for Apple's iPhone, while RIM's BlackBerry fell from a high of 39 percent--and Android licensees collectively rose from a starting point in the single digits--to almost perfectly begin 2011 alongside Apple with equal 27 percent shares of the US market. When only looking at recent adopters, Apple's market share continues to remain very flat over the past year, dipping most just before the launch of iPhone 4. RIM's losses began to show about the same time, six months after Verizon shifted its smartphone marketing muscle from BlackBerry to Android. 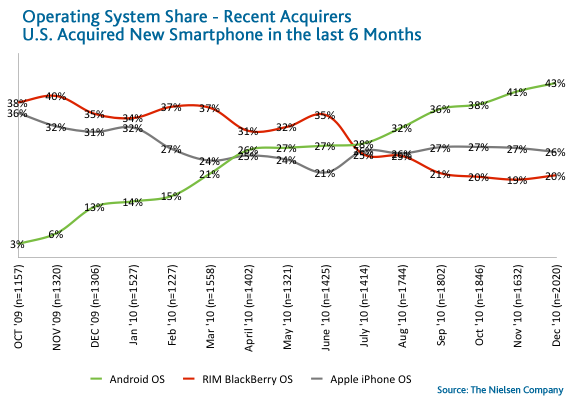 Meanwhile, Android adoption began to surge into the void left by BlackBerry. Whether Android's accelerating adoption is a trend, or simply the result of Verizon's year long focus on the platform as its best hope for an iPhone contender, remains to be seen. Verizon is expected to aggressively shift its resources toward iPhone 4 beginning later this month. About half of all US Android phones are on Verizon. Meanwhile, AT&T is preparing to direct more attention to Android to make up for lost exclusivity of the iPhone, while T-Mobile and Sprint are banking heavily on new Android models to help them sell data contracts on their new networks now being built out. Verizon is also planning to launch Android models capable of using its LTE data network in the second half of the year.